Kumar Chokshanada Sangakkara (Sinhala: ?????? ???????? ; born 27 October 1977) is a Sri Lankan international cricketer and a former captain of the Sri Lankan national team. A left-handed top-order batsman, for much of his career he also played as a wicket-keeper, although he no longer keeps wicket at Test level. As of February 2015, he is the second-highest run-scorer in ODI matches and the fifth-highest run scorer in Test matches. Along with AB de Villiers, he has dominated the number one spot in the ICC Test batting rankings over the past decade. As of February 2015, Kumar Sangakkara is placed at number 1 in ICC test rankings. Sangakkara was a key member of the team that won the 2014 ICC World Twenty20 and was part of the team that made the final of the 2007 Cricket World Cup, 2011 Cricket World Cup, 2009 ICC World Twenty20 and 2012 ICC World Twenty20. He won man of the match award in the final 2014 ICC World Twenty20, where he helped the team win their first title. Sangakkara captained the national team from 2009 to 2011, stepping down after the 2011 ICC World Cup final. The same year, he was named the ODI Cricketer of the Year at the ICC awards ceremony. In 2012, he was honoured as one of the Wisden Cricketers of the Year. Sangakkara is described as one of the "most polished and prudent of batsmen" in cricket. With 11 double centuries, he is second in the list of Test double century-makers, behind only Donald Bradman (12). He is also the first cricketer ever to score 150+ scores in four consecutive Test matches. As the wicket keeper, he has contributed to the highest number of dismissals in ODIs—473. It includes 96 stumpings, which is the highest for a wicket keeper in one-day international cricket. Sangakkara delivered the 2011 MCC Spirit of Cricket Cowdrey Lecture, which gained worldwide attention. He was the youngest person and the first active international player to deliver that lecture, which was widely praised by the cricketing community for its outspoken nature. In terms of number of innings required, Sangakkara is the fastest batsman to reach 8,000, 9,000, 11,000 and 12,000 runs in Test cricket. He is also joint fastest to 10,000. He has won the ICC Cricketer of the Year in 2012, Test Cricketer of the Year in 2012, and ODI Cricketer of the Year multiple times in 2011 and 2013. He has also won the LG Peoples Choice Award twice, in 2011 and 2012. Sangakkara has regularly featured in the World Test XI and World ODI XI, appearing six times and three times in them, respectively. Along with teammate Mahela Jayawardene, he recorded the most partnership runs for the 3rd wicket in Tests, scoring 5890 runs surpassing the 5826 runs of Rahul Dravid and Sachin Tendulkar, during the first test match against Pakistan at Galle International Stadium. The two also hold the record for the highest partnership for any wicket in Test matches, scoring 624 runs for the 3rd wicket against South Africa in 2006. This was the largest partnership for any wicket in first-class cricket, anywhere, ever. On December 3, 2014 he completed 13,000 runs in One-day internationals in the third match of the 2014-15 ODI series with England at the Mahinda Rajapaksa International Stadium, Hambantota, and became the fourth player in one-day history to achieve that feat after Sachin Tendulkar, Ricky Ponting, and Sanath Jayasuriya. He also became the second most prolific half-century maker in One-day internationals during this match. As of 19 January 2015, he has 92 half centuries which is second only to the 96 half centuries of Sachin Tendulkar. On January 3, 2015 he completed 12,000 runs in Tests in the first day of the second test match against New Zealand being played at Wellington, New Zealand. He achieved this feat in 224 innings (his 130th test match), becoming the fastest player to achieve it, surpassing batting legends Sachin Tendulkar and Ricky Ponting. His career average of 58.26 (at his 12001st run) is also almost 3 runs more than Jacque Kallis on the list of top 12 test run scorers. He made his century on day 2 of the test, eventually out for 203. On January 29, 2015, Sangakkara became Sri Lankas highest ever ODI run scorer, surpassing the previous record of 13430 runs held by Sanath Jayasuriya. In the same match, he also broke the record for ODI wicketkeeping dismissals, beating the previous record of 472 held by Adam Gilchrist. Kumar Sangakkara was born to Kumari Surangana and Swarnakumara Sangakkara, an attorney-at-law at Matale, Sri Lanka in 1977. His parents settled in Kandy, where he grew up in his childhood. Kumar received his primary and secondary education at Trinity College, Kandy, an independent elite private boys school situated in the central highlands of Sri Lanka. He has two sisters: Thushari and Saranga, and an elder brother: Vemindra, all who have made national level achievements during their school-life. Sangakkara too started playing a number of sports: badminton, tennis, swimming, table tennis and cricket at the junior school. He was able to win national colors for badminton and tennis at his younger age. The then principal of the Trinity College, Leonard de Alwis, advised his mother to encourage Kumar to concentrate on cricket. He represented his schools under-13 cricket XI under coach Upananda Jayasundera. Berty Wijesinghe coached Sangakkara for under-15, under-17, under-19 and first XI squads. He was awarded The Trinity Lion, the most prestigious prize awarded to a Trinity sportsman, for his exceptional batting and wicket-keeping skills in the 1996 season, at the age of 19. 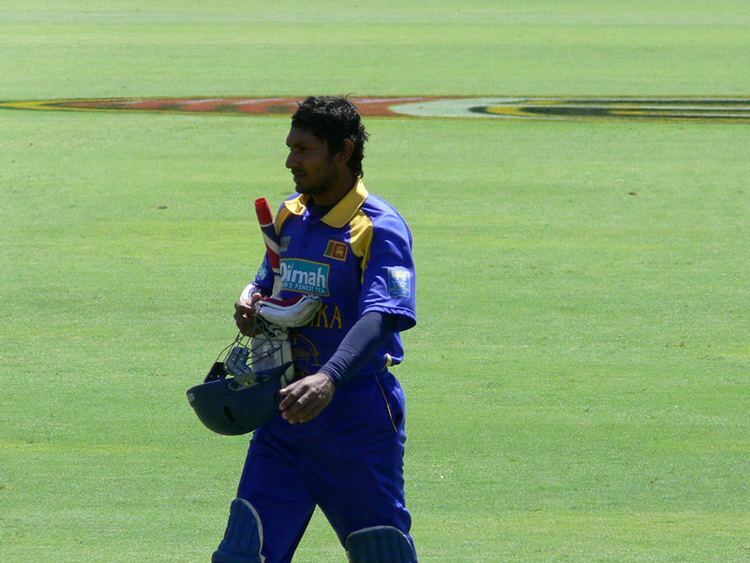 Sangakkara was selected to represent Sri Lanka A cricket team at a tour to South Africa in 1998–99. His knock of unbeaten 156 against Zimbabwe A team at a one-day match, helped him secure a place at the Sri Lankan national cricket team later that year. At the age of 22 Sangakkara made his Test debut on 20 July 2000, keeping wicket in the first fixture of a three-match series against South Africa. Sri Lanka won the match and in his sides only innings Sangakarra batted at the fall of the third wicket and scored 23 runs before he was dismissed leg before wicket by spin bowler Nicky Boje. He received his first man of the match award in the 2nd match of the Singer Triangular Series, 2000, scoring 85 runs against South Africa. He ended the series with 199 runs, at an average of 66.33, securing his place for the upcoming Test series against South Africa. Before reaching his first Test century, he was twice dismissed in the 90s, once against each of South Africa and England. In August 2001, India toured Sri Lanka for three Tests and in the opening match Sangakkara scored his first century. His innings of 105 not out at number three helped set up a ten-wicket victory for Sri Lanka. Later that year Sangakkara scored his second Test century, this time in the first of three matches against the touring West Indians. He scored his first double-century against Pakistan in 2002, at the 2nd Asian Test Championship final. His performance helped Sri Lanka secure the Test championship. In April 2003, Sangakkara made his first ODI century against Pakistan, in a losing effort. Together with Marvan Atapattu, he made a partnership of 438 for the 2nd wicket—4th highest in the world—against Zimbabwe in 2004. In that game, he scored 270, his first 250+ score. In July 2005, he was selected to the ICC World XI ODI team but missed out from its Test counterpart. When Sri Lanka toured Bangladesh in February 2006 regular captain Marvan Atapattu was injured and Mahela Jayawardene became captain while Sangakkara was made vice-captain. Pakistan toured Sri Lanka for two Test and three ODIs in March 2006, and with Atapattu still injured Jayawardene and Sangakkara remained captain and vice-captain respectively. The pair had only expected to hold the positions on an interim basis, but extended into a third series as Atapattu failed to recover in time to tour England in April and ended up filling the roles full-time. In July 2006, Sangakkara made his second-highest Test score to-date (287) against South Africa. In a record-breaking partnership with Mahela Jayawardene, he set up the world record for the highset partnership in Test cricket—624 runs—in this match. In February 2009, the then captain of the Sri Lankan side, Mahela Jayawardene announced that he would step down from captaincy "in the best interests of the Sri Lankan team". He said he believed that it would give his successor around two years to build up to the 2011 Cricket World Cup. Therefore at the age of 31 and with the experience of 80 Tests and 246 ODIs, Sangakkara succeeded Jayawardene as Sri Lankas captain in all formats of the game. His first engagement in the role was the 2009 ICC World Twenty20 hosted by England in June. Sri Lanka became runners-up in the series after winning all the game in group and knock-out stages and being defeated by Pakistan in the final. Sangakkara made 64 not-out in the final, but was unable to take Sri Lanka for the championship. Sri Lanka failed to reach to the knock-out stage of the ICC Champions Trophy in September 2009. The next Indian tour proved to be disastrous for the team, with Sri Lanka being beaten by India in Test series 2–0 and ODI series 3–1. Sri Lankas first fixture after the World Cup was a Sri Lanka tour of England in 2011 beginning in May. During the second match of a three Test series Tillakaratne Dilshan, Sangakkaras successor as captain, suffered a broken thumb. Sangakkara filled-in while Dilshan was off the pitch and formally assumed the captaincy for the final Test. The match ended in a draw and the series ended in a 1–0 victory for England; Sangakarra scored a century in the match, his first against England in nine Tests. Kumar Sangakkara has played in five seasons of the Indian Premier League. Winning bids for him in 2008 and 2011 were US$700,000 by Kings XI Punjab and US$300,000 by Deccan Chargers respectively. He was the captain of the Sunrisers Hyderabad team. Sangakkara has scored 1567 runs with 10 half-centuries in 62 matches in IPL. Sangakkara is married to his longtime partner, Yehali. They have one girl and a boy: Swyree and Kavith. He is involved in a number of charity work in Sri Lanka. He is a member of the Think Wise Initiative, launched by International Cricket Council, Joint United Nations Programme on HIV/AIDS and UNICEF, which is aimed at raising awareness around HIV prevention and eliminating discrimination against people living with HIV and AIDS. He is also a partner of the Foundation of Goodness, a charity launched by Muttiah Muralitharan. Sangakkara is a left-handed top order batsman who likes to hit the ball square of the wicket on the off-side. While the Cut and the pull are natural strokes to him, he tends to play off the front foot. Cover drive is one of his regular scoring shots. Sangakkara averages around 57 in Test cricket. Among the current Test batsmen, he holds the best average. In ODI cricket, he retains an average of 40. Sangakkara handed over his wicket-keeping duty to Prasanna Jayawardene in Tests cricket in 2009 (on Boxing Day, 2012, he had to replace him behind the wicket after Jayawardene suffered an injured right thumb against Australia). Now he plays as a specialist batsman in Tests, and wicket keeper-batsman in other formats of the game. He is the third in the list of wicket keepers who contributed to the most numnber of dismissals in ODI cricket. With 382 dismissals, he is behind Adam Gilchrist and Mark Boucher. He is also the wicket keeper with highest number of stumpings—81—in ODI cricket.